Chris Sparks here,with only hours left in 2012, I wanted to send a note thanking the contributors, auction winners, book buyers, donors, cheerleaders,all of the fine folks at the Michael J Fox Foundation, anyone I forgot to mention and of course Richard Thompson. From that moment, the wheels were turning and with Richards blessing Team Cul de Sac started in 2010 with a donation to Team Fox for $50.00 from me to start Team Cul de Sac. In 2011, we sold prints signed by Richard, TCDS t-shirts and had a drink and draw evening at Heroescon . We raised over four thousand dollars. This year we had many ways to raise money for Michael J Fox Foundation. We had a wonderful auction, the book was released, a drink and draw and Heroescon, donations from Sparking Design who donated money from book sales from our website, the TCDS fanzine, we even had a few signed copies by Richard, Bill and Nick. Also a bunch of folks donated money to Team Cul de Sac. Opening the advance copies of the book in May! This was a very satisfying moment seeing everything coming together. Meeting or receiving emails from friends, family members and folks with Parkinson’s. Their love and friendship made this journey so meaningful. Sneak peak of the book to the contributors and other cartoonists and the NCS awards in Las Vegas. 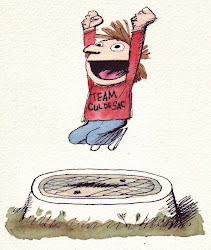 I signed the first copy of Team Cul de Sac to Michael J Fox and I attended the MJFF Gala in NYC. A special thank you goes to Katy Robbins Reitz for all of her hard work at Team Fox. Engineering a Bill Watterson and Richard Thompson gathering. Without a doubt, two of the greatest cartoonists to spill ink on paper. Fun times for all. I had my first book signing with Richard and having over ten other TCDS contributors at One More Page in Arlington VA. Watching the end of the auction unfold and amazed by the money we made! Having Jennifer my wife, Emily my daughter and my business partner Jamie, at the book signing at Politics and Prose in Washington DC. Being a guest at Heroescon (plus drink and draw for Team Cul de Sac) and being a guest at Baltimorecon and the Harvey Awards. FUN times and great support from so many people! Meeting contributors throughout the year and knowing we will have made over $100.000 with the matching funds this year. Thank you to everyone who made this year a success and raising awareness for Parkinson’s research. Big thanks to Craig,Katy,Mike(s),Nick Bill and Richard. Stay tuned to our blog and facebook page for news on upcoming news!